We got this book – Amazing Animals by Innovative Kids, from a yard sale back in California. A retired teacher had carefully and neatly boxed them. My 5 year old was just 2.5 at that time, but these books were so absolutely awesome, that we could not resist and picked up the whole box. She is now reading by herself and is starting to comprehend what she read. These are a set of 10 books, each of them about 7-10 pages, the pages starting with a 2 word sentence, builds upon the same sentence, making them longer as we move ahead. It is particularly useful for the kid who has started to read sentences and is now trying to remember and comprehend after reading a few sentences. Page 1 : The pike. Page 2 : The pike glides. Page 3 : The pike glides and likes to ride. 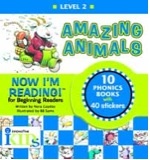 The amazing animals is a series of 10 booklets, introducing long vowel sound, also allowing the child to note the difference between the long and short vowels. Each booklet also emphasizes on a certain phonetic skill. Like in the example above, it emphasis on the long “i” sound and the consonant blend “gl”. Since we are on the topic on vowels, here is a quick cheat sheet. – What sound a vowel makes depends on its position in the word. In most cases, when a vowel is followed by another vowel immediately or after one consonant, it makes the long vowel sound, like in goal. Note the short vowel changing into a long vowel sound when a “e” is added at the end. At Vs Ate. Cut Vs Cute. Win Vs Wine. Mop Vs Mope. – When one vowel is followed by another immediately, the second vowel becomes silent, like in goal, the “a” is silent. – When a word ending with an “e” has another vowel in it, for the most part this ending “e” becomes silent. Like in cute, apple, adore. Here are some words to practice the long and short vowel sounds. Short vowel sound of “a” as in apple, ant, alligator. Long vowel sound of “a” as in ape, game, race, lake. Short vowel sound of “e” as in egg, elephant, . Long vowel sound of “e” as in eat, seed, meat. Short vowel sound of “i” as in silk, lips, ship. Long vowel sound of “i” as in mice, white, smile. Short vowel sound of “o” as in got, on, off. Long vowel sound of “o” as in goat, nose, hole. Short vowel sound of “u” as in lunch, bug, gulp, tunnel. Long vowel sound of “u” as in mule, tube, cute, tune. There are exceptions, but these rules can be applied for the most part. !! H A P P Y R E A D I N G ! !